You should expect to get your hands dirty if you take a management, leadership, and decisions science (MLD) course at the Harvard Kennedy School. 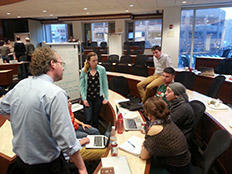 Learning-by-doing is a key pedagogical component of the majority of MLD area courses at HKS. Running a range from personal case analyses, “live” case and negotiation simulations, simulated-client projects, to fieldwork for real clients and organizations, MLD students learn by experiencing for themselves real world lessons in management, leadership, teamwork, and decision making. The Spring 2015 MLD Area Newsletter is now available. Click the front page below to view or download.